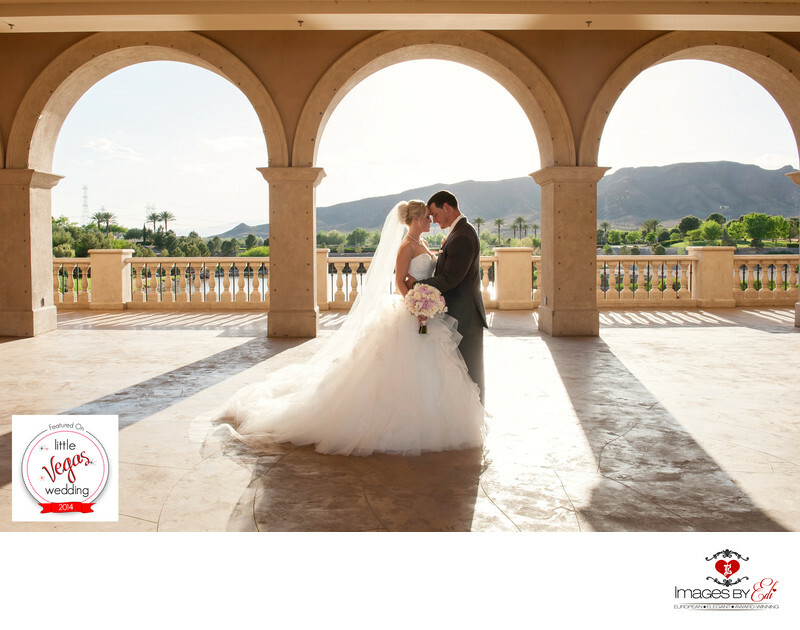 Dreamy Hilton Lake Las Vegas Wedding Featured on Little Vegas wedding Blog in 2014. Romantic, traditional wedding ceremony at Capella Di Amore wedding chapel at Hilton Lake Las Vegas Resort on the bridge, overlooking the lake, was the venue well-suited to the bride's childhood vision of a fairytale wedding. She always knew, that she wanted to feel like a princess on her big day. Their wedding colors of soft pink mixed with Tiffany blue and a hugely dramatic wedding gown perfected this classic Las Vegas wedding and make this couple’s dream day come true. The flower girl dresses, flower girl wands, table numbers, menus, seating name cards, bouquet for the toss, favors, garters and much more was done by the bride and her sister. They saved a lot of money making these themselves and they gave the venue a unique feel. This image of the couple was taken right outside the Capella Di Amore wedding chapel, on the bridge, with arches. The sun is hitting from behind, creating a beautiful dreamy feel for the photo.